"'Einkels!" "No they Ain't, They're Messerschmitts!" I arrived home this evening to find a parcel waiting for me. 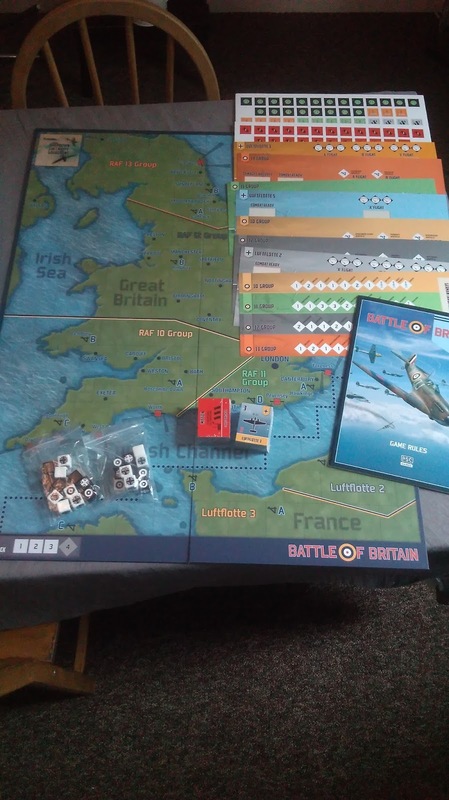 It's one I've been looking forward to receiving for quite a while now: The Plastic Soldier Company's Battle of Britain board game! This was a Kickstarter that went live over 18 months ago now! I think it was around last April that I backed the project and it has finally been released. I know there have been a few problem with production along the way and I trusted PSC enough to deliver, so I wasn't unduly worried about delivery. 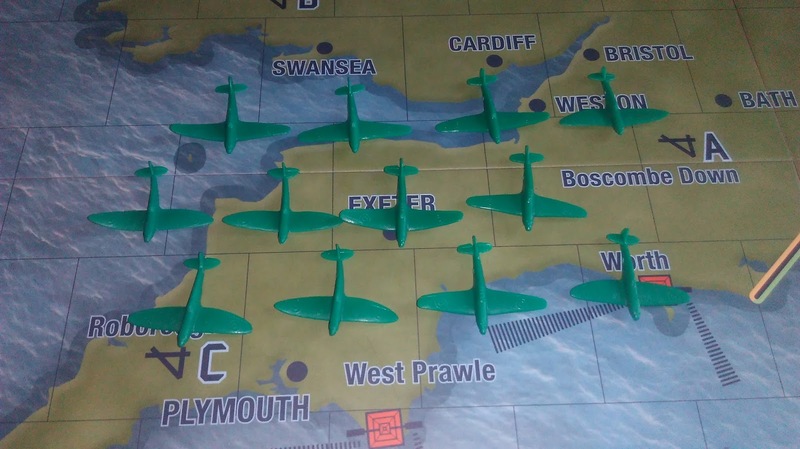 As a thank you for the patience, Kickstarter backers have also got a 1/144th scale Zveda ME109F, which will come in very useful for my WW2 games. Also we got a 25% off voucher (I've covered up the discount code 😀). Inside we have a lot of material; game counters, two bags each of twelve dice, play aids, rules booklet and two sets of cards. Also is this pretty big playing board. Also included are a set of stickers for the flight stands, each relating to one of the squadron cards. "But what about the toys!?" I hear you cry! 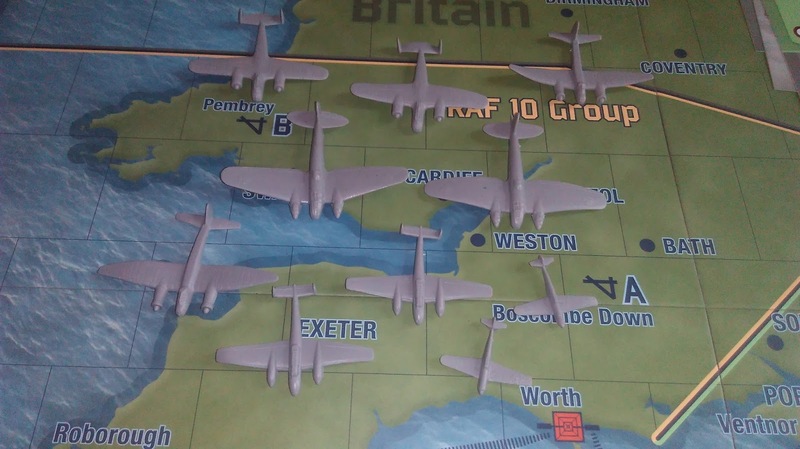 Well, here are the Germans, ten aircraft including Heinkel HE111s, Messerschmitt BF109s and 110s, Dorniers Do17s and Junkers Ju88s. 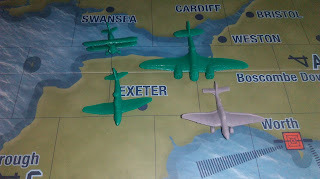 And the British, Spitfires and Hurricanes! Twelve in total. And as an extra bonus for us Kickstarter backers is this set of extra aircraft, a Gloster Gladiator, Blenheim, Bolton-Paul Defiant and a Ju-87 Stuka! 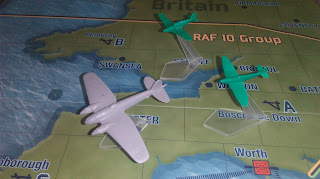 And here are the previously mentioned flight stands in action as a Spit and Huri chase away a 111 from Bristol. 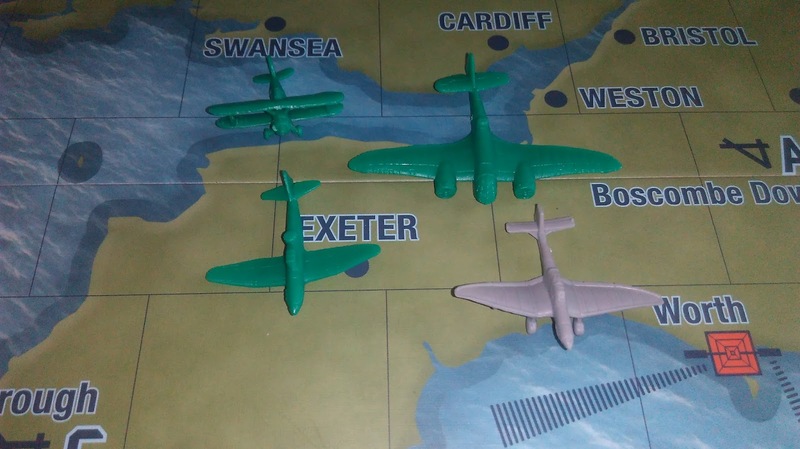 You may have noticed that some of the wings on the aircraft are slightly bent, this must be from transportation, but it's nothing that a bit of warm water won't fix as the plastic is pretty soft. So, initially it all looks good, but I haven't had a chance to read the rules yet and a game rests on it's rules! However, Richard Borg has written some good rules in the past (Memoir '44/The Great War for instance) so I expect good things with this one as well. On a minor note, I don't like the colour of the plastic aircraft, but that will be easily fixed with lick of paint. 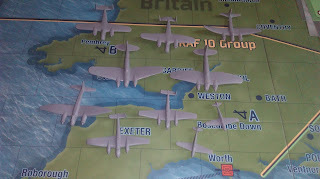 Being that they are 1/300th scale it won't take very long to get them looking good! I don't know if this is live on the PSC webstore yet, but they will be releasing it pretty soon I believe. Nice reference...how about "The engines overheating and so am I". 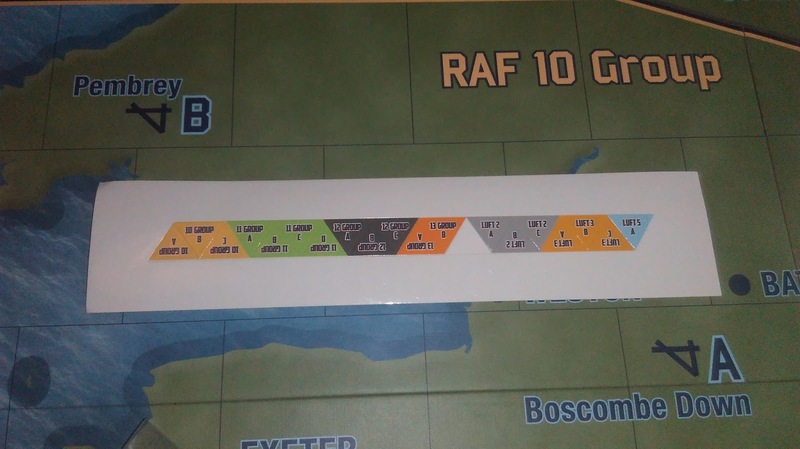 What scale are the models, roughly? "Repeat please!" I think they are 1/300th, I seem to recall reading that somewhere along the line. They seem about the right size for 1/300th anyway. I have yet to receive my game. Now I am not looking forward to it after seeing this and other first impressions. I cannot believe the game has taken so long to produce. As the game has been in production before, I cannot understand why this has happened. 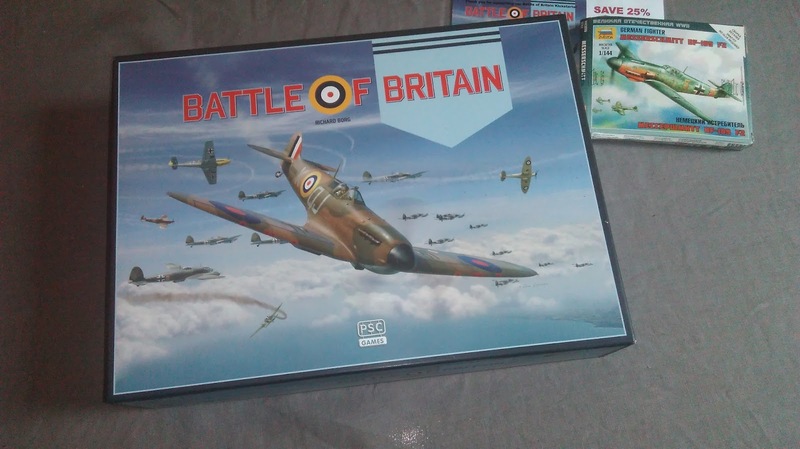 I thought the aircraft would have been made in hard plastic and be of good quality, like those illustrated in the Kickstarter images. I have not had any dealings as a customer with PSC in the past. I certainly will not in the future. This was my first and probably last Kickstarter. Hopefully I will actually receive something for my money soon?